Annan followed up their mid week victory over Queens Park with a solitary goal victory over Berwick Rangers at a sun drenched Galabank on Saturday, and the three points gained very much keeps Annan’s play off hopes alive. Annan manager Jim Chapman having thought he had a full squad to pick from was dealt a hammer blow when Steven Black, Steven Swinglehurst and Kevin Nicoll were all withdrawn due to a sickness bug so it was pleasing to see on loan Celtic man Jack Breslin available to take over at the centre of defence alongside Peter Watson. There was nothing between the teams and Berwick Rangers will no doubt feel they should have had a share of the points in a game where scoring chances were few and far between. The closest we came to a goal in the first half was mid way through the half when Josh Todd cut in from the left and was fouled just outside the box. Once again Weatherson stepped up and he was denied a goal by an excellent save from Kevin Walker who managed to tip Weathersons low shot on to the base of the post. Berwick created a good opening in the 35th minute when full back Euan McNeil whipped in an inviting ball from the right but fortunately for Annan the ball went across the face of the goal and to safety. As the game approached half time Martin McNiff’s excellent challenge on Michael McKenna averted a potentially dangerous situation as the Berwick striker homed in on goal. After a goal-less first half Berwick created the best chance of the match in the 60th minute and Annan had keeper Jordan Hart to thank for a superb save when he denied Darren Lavery after the Berwick striker was released clean through on goal but Hart was quick to read the situation to deny the striker with a brave save. It was a missed opportunity for the Borderers and the save set up Annan for the victory. In the 78th minute Rabin Omar made a penetrating run down the left finishing with a lay off into the path of Flynn who’s well struck shot was saved by Kevin Walker. 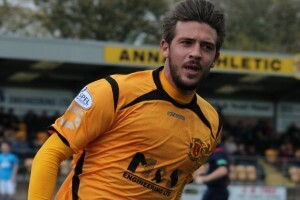 It was however the same duo who combined for Annan in the 84th minute to make the breakthrough. Omar played in Flynn who finished with a stunning shot which arrowed into the net via the post and past the diving walker from all of 20 yards. It proved to be the defining moment in the match with a goal fitting to win any game but on a day when all the top five teams grabbed points it could prove crucial for Annan in their quest to make the play offs. Another plus factor for the Annan boss must have been how his re-arranged defence maintained a clean sheet. Annan now face three crucial games all away from home with Clyde first up on Tuesday evening followed by matches at Montrose and Elgin. ANNAN ATHLETIC: Jordan Hart, Ben Jago (Smart Osadolor 78 min), Jack Breslin, Martin McNiff, Peter Watson, Barry Cuddihy, Rabin Omar, Mathew Flynn (Steven Sloan 85 min), Peter Weatherson, Josh Todd, Lewis Guy (Ryan McStay 65 min) SUBS NOT USED: Blair Currie GK , Stuart McColm, Jordan Morton and Liam Park. BERWICK RANGERS :Kevin Walker, Ewan McNeil, Callum Crane, Steven Notman , Robert Wilson (Alexander Cunningham 85 min), Jonny Fairbairn, Finn Graham (Dylan Stevenson 87 min), Jordan McGregor, Michael McKenna, Blair Henderson, Darren Lavery . SUBS NOT USED: Graham Beveridge, Dwayne Coultress, Daniel Watt, Mark Walters GK. REFEREE: Alan Newlands, Assistants Frank Connor and Tony Kelly.